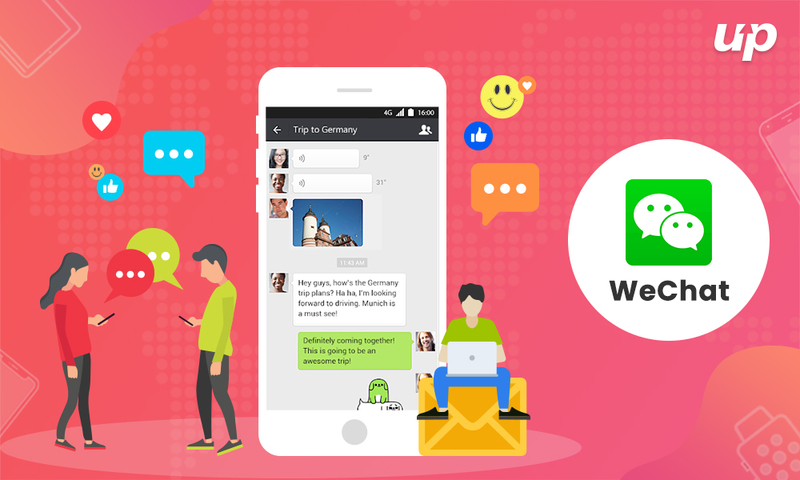 WeChat is one of the most popular chatting apps in China that is equipped with great features. This app is quite different from Facebook, Viber, and Whatsapp but because of its unique features which are extremely useful for people. Needless to say, this app provides a practical way to manage hard-earned money as we can do multiple tasks i.e., from ordering food to pay for utilities. Presently, mobile applications have completely revolutionized the mobile app development world so every business is looking for latest fruitful trends. Mobile apps are the best thing through which you can keep customers’ engaged and boost your online presence. This app offers the ability to send money in the form of virtual credits. After that, this money is transferred into the user’s WeChat Pay account. Besides this, there are two types of envelopes i.e., regular and group. The unique thing about the red pack is that it can be sent to individuals. On the other hand, grouped envelop can be posted to group chat. You will be surprised to know that “hongbao” has entered in this digital era through Red Packets. If you are going out with friends then splitting the bills might be difficult for you. Well, mobile app developers have resolved this problem too. By using Go Dutch feature, you can easily do this and it is extremely simple to use. All you need to do is just create a group and then request compensation. Now, the individuals will get notifications and they can also view payment details from other group members. You can choose particular people as well as choose a specific amount of money each person owns. a) With the help of Quick Pay, users can present pay codes that vendors scan to complete the transaction. b) QR code payments are the most popular option for overseas Wechat e-commerce. c) By using in-app web-based payment, users can purchase through a WeChat store. d) In-app payment is the best option through which users can make payment in other partner apps. e) If we talk about PC/mobile web browser page, a web page generates a code that is sent to the Payment page. WeChat Moments is quite similar to Facebook news feeds where we can share our activities. Now, users can control who can view their feeds. If we talk about Facebook then we can comment on the posts but Moments does not allow such things. Needless to say, Moments has become ubiquitous as people are continuously switching towards it. The most popular feature of WeChat is its integrated gaming platform. Tencent is the WeChat’s parent company that has brought major changes. Now, users can download and launch games within the app and add the more social dimension to their gaming experience. If you want to meet a new chat WeChat buddy then just shake your phone. Needless to say, Shake is a simple concept with far-reaching consequences. All you need to do is go to the “Discover” tab, click on Shake button and just start shaking your phone. This concept is quite unique for West people but for China people, it is a medium to meet with new people. Why Wechat is Successful in China? WeChat looks like Whatsapp but there exist a lot of similarities and dissimilarities. It is not just a messaging app through which we can connect with friends, send messages, videos; in fact, it is more than that. This Chinese messaging app consist host of mini-programs that covers all aspects of a person’s daily life. From ordering food to provide invoice information, we can perform numerous activities in with this single application. 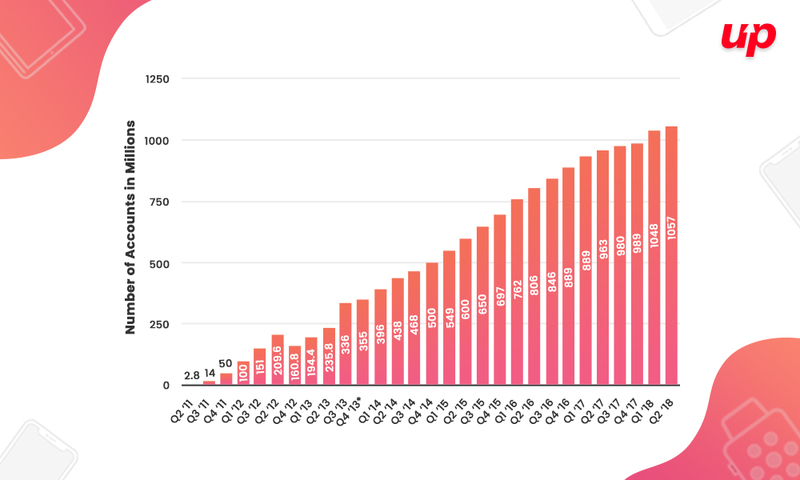 WeChat was launched in 2011 and since then it has overtaken all of its rivals. No doubt in saying that the popularity of WeChat is getting high day by day. Just have a look at the graph. If we talk about its features, it offers a virtual smorgasbord of useful functions i.e., messaging, video calls, moments, interest groups, online payments, official company accounts, advertising options. Despite being Chinese in origin, WeChat is giving tough competition to Facebook. Simply, it is a multi-purpose platform that offers real convenience by being able to perform a lot of activities and users need not switch between apps. This messenger app also works as a media platform from where we can get media and news information. Presently, Android app development companies are pushing their business to increase their presence on WeChat. If you are in China then you can’t use Facebook, Google, Twitter, Youtube as all of these websites are blocked since 2010. Because of this, Chinese users are more inclined towards WeChat as this app has the capability to fulfill numerous tasks. Because of this, users don’t have to rely on mobile applications to accomplish various tasks. Also Read : How to Grow Your App Idea Successfully? Companies can easily get an official account within the app that is quite similar to a mini website with individual pages. Businesses have the ability to post daily updates such as blog post, video, infographic to the subscription accounts. There is an advanced functionality for customers where they can pay for goods and services through WeChat account. The businesses that have 100,000 followers can purchase ads and promote their services. If you want to set up your company in China then WeChat can prove extremely beneficial for you. This messenger app provides great functionality through which businesses can tap into its large base. WeChat is the most popular app in China that has 1.05 billion MAU. Because of its exciting features, it has become an easy to use one-stop solution to do all tasks digitally. Do you need a similar app like WeChat for your business? Get in touch with Fluper where outstanding mobile app development services are delivered to clients to achieve the best results. Next articleWhat’s New on Twitter for Android & iPhone Users?